Imagine your dog automatically looking at you every time he sees another dog! Whether a dog reacts to others by barking, growling, stiffening, or hiding behind your legs, this eBook provides exactly what owners need to turn this common and frustrating problem around. Clients tell us they love the simplicity and elegance of the methods described and find them useful in a wide range of situations. Included are sections on the best leashes and collars to use with reactive dogs, advice on training dogs who are especially afraid of others, and practicing “Emergency Exits” when you’re surprised by dogs during training sessions. Better Together! 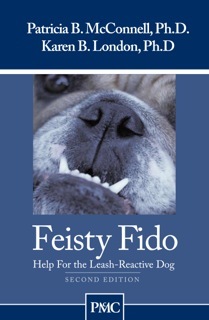 Order the Dog-Dog Reactivity DVD along with The Feisty Fido book for a more in-depth look at reactivity and aggression, as well as live demonstrations with real feisty fidos. An essential guide in the library of thousands of trainers, this eBook increases your effectiveness by giving clients a clear, concise summary of powerful and positive behavior modification. Equally useful for a novice and a seasoned trainer, The Feisty Fido is a practical step-by-step guide that can help everyone stay on track. Even the best of us need a coach every once in awhile! Help your clients address a common behavioral issue, and prevent a more serious one, with this simple, easy-to-follow eBook that is based on scientifically proven and humane methods. Increase the adoptability of fearful and reactive dogs in your behavior modification programs by using the simple tools provided in this book. Let The Feisty Fido help ensure consistency once a dog is in a new home, and increase her chance for a successful placement. calmly and politely past five barking dogs today. I was delighted!" dog training/behavior books, and this one is one of the best." “An incredible assets for trainers dealing with all levels of aggression in dogs. I have used the methods with good success on three client cases.